Hello my name is Lizzy. I volunteered with OuTrop this year and I am one of their avid supporters. At the age of 14, I set my life goal to see wild Bornean orangutans and, with OuTrop’s help, I saw 5 within my first day in the Sabangau Forest. I was lucky enough to enter the forest that day with Bec, the orangutan expert. Very quickly we heard the snapping of branches and the rustling of leaves. We followed the sound and seemed to be wandering around aimlessly for a while, stopping and starting to see if we could hear anymore. With my untrained ears I had no idea what we were listening for, but Bec guided me, telling me what she could hear and what it meant. More trees snapping, so that’s not just a strong wind then? (Because I could really do with it in this heat!) Nope, an orangutan on the move! Soon I got to see my first orangutan of the day. A male, he was moving from tree to tree for food. We followed him into an area, with lots of fallen trees, and luckily I had brought my camera and got some clear shots of him perched up high eating. I’m sure he was keeping an eye on us down below. It was an amazing first sighting! 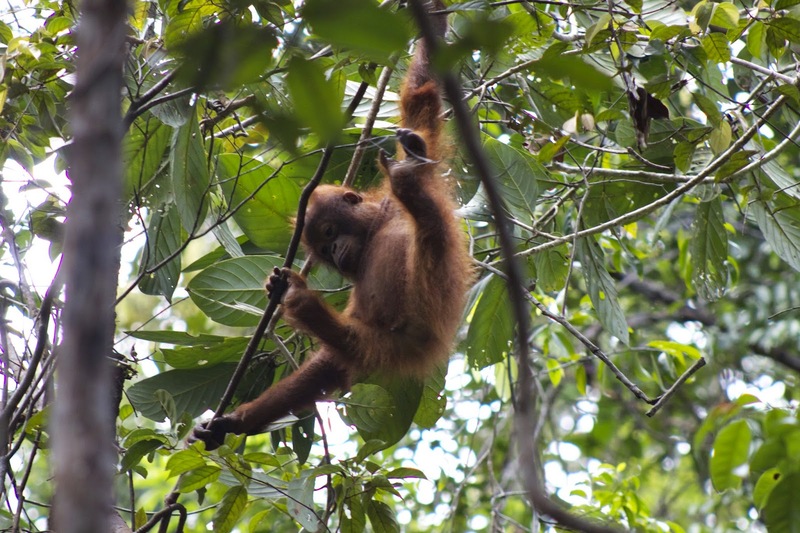 We heard the other orangutan researchers had found two mother and infant pairs. Feb and Fio as well as Indi and Icarus. 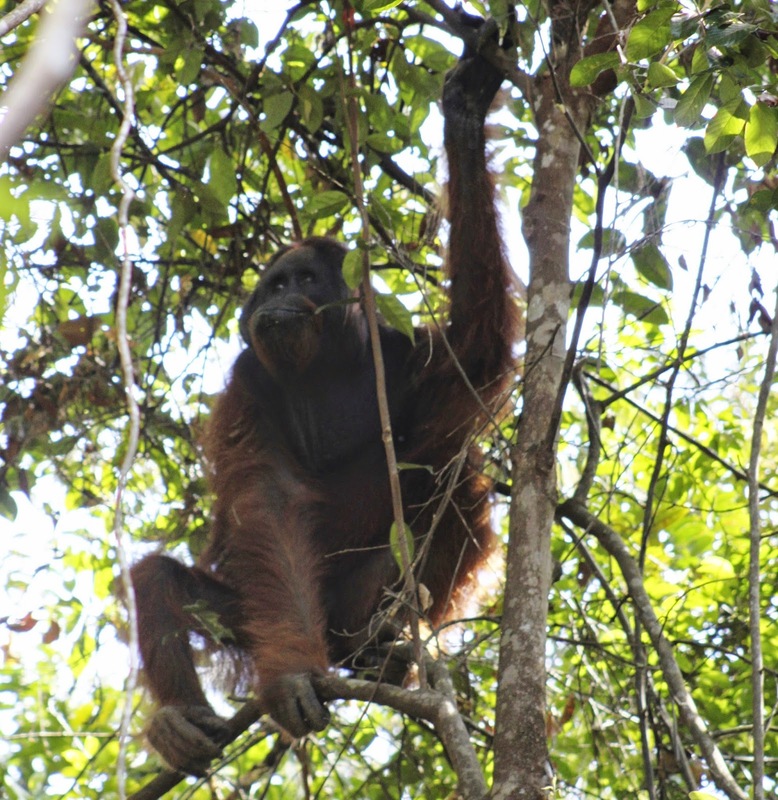 Bec explained to me that Feb was the most habituated orangutan, so we could follow the mother and son pair closely. Feb found a puddle under a fallen tree. She spread her unbelievably long arms and legs, bringing herself to the floor to have a sip. Fio on the other hand was busy putting everything in his mouth and picking his nose, as most youngsters like to do. We followed them for a while, watching them eat termites, play around and eventually move off into denser forest. It was definitely a great first impression. The entire trip followed in its steps. From the delicious local food made by the wonderful camp cook, Lis, to the early starts to listen to the gibbons sing. The trip was something that will never be forgotten. This could be you next year! Apply now to be a 2015 OuTrop volunteer here.